“Maxwell’s electromagnetic theory, which was formulated 150 years ago, was one of the greatest breakthroughs in physics. It united electricity and magnetism, provided an ultimate description of electromagnetic waves, including light, and anticipated relativity and the field theories of the 20th century. More recently, more than 60 years ago, scientists found that electromagnetic radiation can not only propagate in free space but can also form surface waves at interfaces between different media, such as between metals and air or glass. This resulted in the development of plasmonics and metamaterials, where surface electromagnetic waves underpin a number of phenomena and useful applications. Now, in a paper published in Nature Communications, scientists from the RIKEN Cluster for Pioneering Research in Japan showed that the well-known surface electromagnetic waves at interfaces between homogeneous isotropic media, obtained within classical Maxwell’s electromagnetism, also have a purely topological origin, similar to quantum topological states. 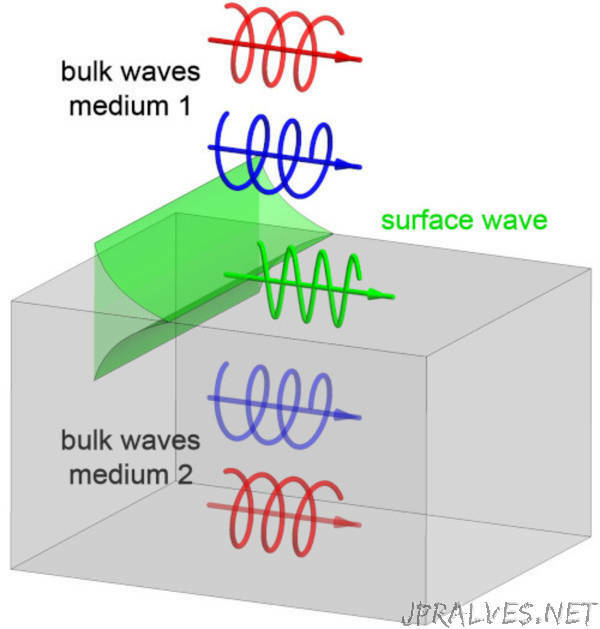 This new approach illuminates the origin of surface electromagnetic waves and explains why these waves appear at interfaces where one of the medium parameters (dielectric permittivity or magnetic permeability) changes its sign. Moreover, the number of surface modes is determined by the number of the bulk-medium parameters changing their signs at the interface, which is called “bulk-boundary correspondence” in the topological formalism.